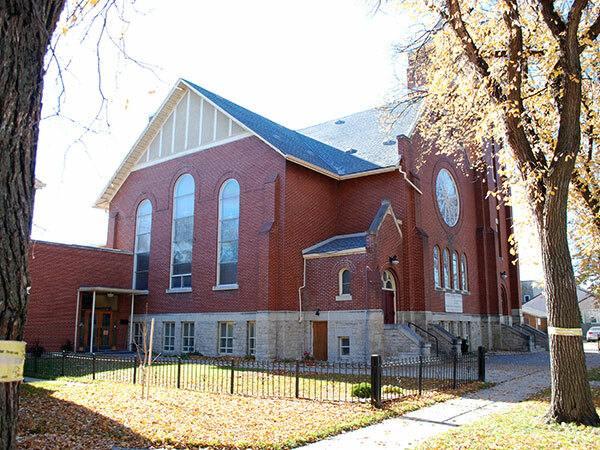 Built at Winnipeg in 1905 at the southeast corner of Pembina Street (now Osborne Street) and Oakwood Avenue, the Riverview Presbyterian Church was the first church in South Fort Rouge. Located near the River Park, a structure measuring 28 by 48 feet was erected on donated property, along with a 20-foot square school classroom. Completed at a cost of $3,000, with capacity for 200 people, the facility opened on 10 September 1905. 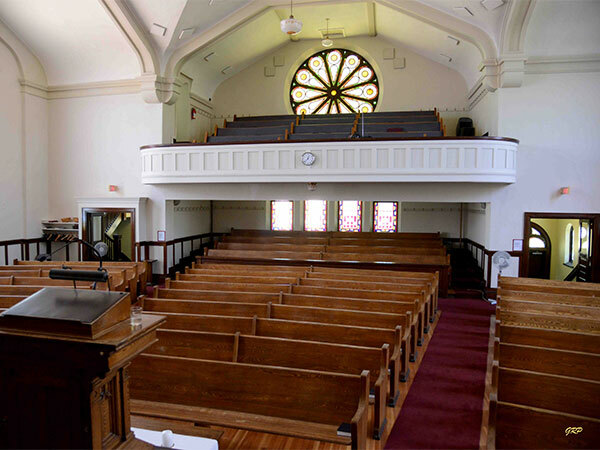 The classroom was used for Sunday School under the early direction of T. Gordon Russell. During the week, the space was rented to the Winnipeg School Board for use as Riverview School (1906-1908). The school relocated to its present Casey Street site, with students and staff permanently moving there on 10 November 1908. Over the years, the building was expanded two times to provide greater capacity, the first in 1910, when the structure was refurbished and expanded by contractor J. B. Morrison at a cost of around $2,400. Work was undertaken between April and July and seating capacity more than doubled to around 450, with the church’s reopening service held on 10 July 1910. 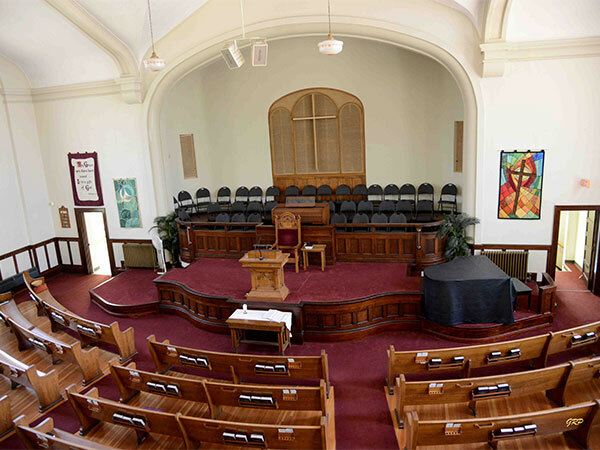 When the congregation commissioned a new structure in 1925 at a cost of $50,000. It was the first United Church built in Canada. The old building was relocated to the rear of the site and converted into a gymnasium. The adjacent Christan Education Building / Hall was built in 1956 and dedicated in March of that year. Following a mortgage-burning ceremony in April 1960, the hall was named in honour of Reverend George M. F. Marshall. Source: Archives of Manitoba, Western Canada Fire Underwriters Association, Series 2, Winnipeg - Sheet 404. “Riverview Presbyterian Church,” Manitoba Free Press, 10 October 1905, page 56. “Riverview Church,” Winnipeg Tribune, 16 December 1905, page 22. “Tenders for Riverview Church,” Winnipeg Tribune, 12 April 1910, page 5. “Riverview Church opening,” Winnipeg Tribune, 9 July 1910, page 5. “Riverview Church,” Winnipeg Tribune, 9 July 1910, page 19. “Riverview Church has 132 in Army,” Winnipeg Tribune, 25 March 1916, page 23. “Riverview Church to open Sunday,” Manitoba Free Press, 12 December 1925, page 29. “Resigns,” Winnipeg Tribune, 26 March 1938, page 32. “32nd birthday celebration at Riverview,” Winnipeg Tribune, 14 October 1939, page 16. “Anniversary to Riverview to be marked,” Winnipeg Tribune, 26 October 1940, page 18. “Rev. T. S. Watson is invited to Riverview United,” Winnipeg Free Press, 3 May 1947, page 3. “Riverview United inducts Marshall as new Minister,” Winnipeg Free Press, 7 September 1950, page 25. “Rosedale scouts plan for tudor rose tea,” Winnipeg Free Press, 25 April 1957, page 22. “Golden Jubilee at Riverview,” Winnipeg Free Press, 26 October 1957, page 33. “Riverview United names 10 to Board of Managers,” Winnipeg Free Press, 5 February 1960, page 18. “Sacred music to the fore in United Church services,” Winnipeg Free Press, 16 April 1960, page 22. “United - 2 services for nursing graduates,” Winnipeg Free Press, 14 May 1960, page 28. “Riverview United okays new Manse,” Winnipeg Free Press, 11 February 1961, page 5.